The mind has a way of interfering with personal happiness, often causing stress and doubt. Getting in touch with one's inner source of peace and following its guidance over the mind's often-unfounded concerns requires training and discipline. Knowing this truth intimately, Peaceful Mind Peaceful Life Founder Barb Schmidt developed a three-part spiritual discipline called The Practice. The Practice is a toolkit to be used throughout the day to guide people who are looking for confidence, less stress, and deeper meaning along life's path. These tools are a compilation of the great Truths taught by authentic teachers and masters throughout the centuries from various religious and spiritual traditions. In the first three chapters of The Practice, readers are guided through the daily routine: Waking Up, Living Present, and Letting Go. Beginning with a morning meditation, a thread of peace is followed over the course of the day through the repetition of a sacred mantra, practicing focused attention, reading for inspiration, and reflecting on the day. In the concluding chapter, readers are provided with an opportunity to deepen their experience of The Practice with engaging exercises. When I listened to Tenzin Palmo talk about the mind on a retreat in 2010, I completely understood what she meant about our mind being our closest companion. It is always with us. I also remember thinking that this companion of ours can often sound like an annoying broken record, harping on the same old complaints and concerns. Listening to all the mind's judgments, worries, planning, memories, and fantasies is stressful and drains our energy, interferes with our ability to be present, and keeps us focused on outward things that are supposed to make us feel happy. When we are so focused on what is going on in our minds, we are not able to function at our highest level or fully appreciate our blessings. We look at the state of the world and all its problems, all our problems, and we question how we can be happy with all that is going on. We wonder about the injustice of it all and often lose patience with others and ourselves for not being able to 'make things right' and 'just be happy.' Living this way can cause us a great deal of suffering and a lot of stress. So we look for distractions, outward things, to make us feel better. In our society, there is no shortage of them. The media bombards us with flashy images and false promises. These external influences somehow sink their hooks into our hearts and convince us that we need them to find the happiness and fulfillment we are longing for. From very early on, we have been taught by society that if we 'get this' and 'achieve that,' life will be great and we will be happy. But no matter how much we accumulate or use to make us feel better or forget, we still feel as if something is missing. 'Things' cannot make us happy, and even though we know this deep down, we still hope that maybe this one more thing will be 'the thing' that will do it for us. Here is the good news: The potential to be happy is right inside of us—there is nothing we need to find and then figure out how to get. Nothing we seek on the outside can compare to that. We might think we have found something or someone who 'completes' us, that gives us the 'wholeness' we are in search of, but we all know from experience that feelings based on changing circumstances do not last. People age and die, situations end, tragedy strikes, natural disasters occur, things get used up or are no longer useful, and the list goes on and on. However, in reality, what never changes is within each one of us, and this is the part that makes us whole. Carl Jung wrote, 'Your vision will become clear when you look into your heart. Who looks outside dreams, who looks inside awakens.' When our hearts awaken to this Truth, we can all say with deep sincerity and knowing, 'I am complete.' When we live from within, we will know peace and happiness. The daily stresses of life will be more manageable, and our days will be more fulfilling. When I heard the Dalai Lama speak at Florida Atlantic University as part of the Peace Studies Program in 2010, he repeated a sentiment that he often shares: 'Life is meant to be happy.' We are meant to be happy. Our minds con us into wondering what that means. Are we happy? Why aren't we happy? We think it is a feeling we sometimes have: 'How do you feel?' someone asks, and the other person replies, 'Well, I was happy yesterday, but today I'm not so happy because this happened to me. It was so stressful!' That sort of happiness is like riding a roller coaster—fleeting at best. When the great masters and teachers talk about happiness, they are talking about that underlying sense of joy, peace, and security that we will find inward when we seek it through stillness and by being present to the moments of our lives. This place of stillness is within each one of us, and we can tap into it by having a spiritual practice that quiets the mind—not to get rid of it, but to enrich and nourish it and teach it to listen inwardly. 'The word that comes out of listening changes hearts,' says my friend James Finley, a Thomas Merton scholar. This is a profound Truth: change happens within. The idea is to cultivate our minds the way we would a garden, by planting the plants we want, tending to them regularly, and keeping the ground fertile. When we do this daily, we start to align our mind, body, and heart so that each part of us works together in unity with a beautiful rhythm. This is what The Practice helps us do. We are like a magnificent tree with an incredible root system. Even though we cannot see what is going on underground, we know that the root system is vital to the tree's ability to thrive. The roots are its strength, its foundation, and what gives the tree its nourishment. And the same is true for us. Even if we cannot see it, our strength and nurturing is there inside us, providing us with everything we need to thrive. ©2014 Barb Schmidt.All rights reserved. 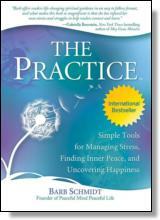 Reprinted from The Practice: Simple Tools for Managing Stress, Finding Inner Peace, and Uncovering Happiness. No part of this publication may be reproduced, stored in a retrieval system or transmitted in any form or by any means, without the written permission of the publisher. Publisher: Health Communications, Inc., 3201 SW 15th Street, Deerfield Beach, FL 33442. Barb Schmidt is a businesswoman, philanthropist, and spiritual teacher with over thirty years devoted to spiritual development. She has studied with many notable teachers such as Thich Nhat Hanh, Deepak Chopra, and Marianne Williamson. In 2001, she partnered with Florida Atlantic University's Peace Studies Program to promote dialogue on the topic of inner and outer peace. For the past ten years, she has been offering quarterly workshops and weekly classes on spiritual practices as well as lecturing at various schools and organizations on living a meaningful life. She lives in Boca Raton, Florida.